The 10-meter high "Lucky Tree" in the Longhua Temple of Shanghai has a part to play in the temple's New Year's Eve celebrations. Visitors may buy a "lucky scrip" and write down their hopes for 2006. Then they knot the scrip and throw it onto the tree's branches. The tree will be lit on New Year's Eve and visitors can write down a wish and tie it on a branch. A lotus-shaped stand is built underneath the tree with the Chinese character fu (meaning luck) engraved on it 1,000 times. "Before we used paper and cardboard to build the tree," said Deng. "But this year we want something more solid that can last for the next few years." 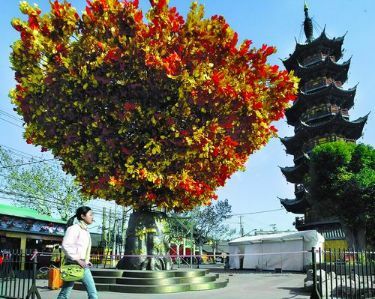 The Wishing Tree will stay in the square until after Chinese New Year, according to Deng. Charity donations will also be held before the bell is struck 108 times. Red Cross volunteers will circulate around the square to collect money. The bureau has also set up boutiques to sell gifts and snacks. Visitors in the square will be able to watch ongoing events inside the temple on a huge TV screen. Most tourists at the bell striking ceremony are from Japan, according to the bureau. This year the temple expects about 700 Japanese tourists, Deng said. Meanwhile, Koreans and travelers from Southeast Asian countries are also increasing gradually. The Longhua bell striking ceremony has been a tradition since 1988. Every New Year's Eve, 108 honored visitors climb the Longhua Bell Tower and strike the 2-meter-high bronze bell. Traditional New Year Food Losing Attraction?